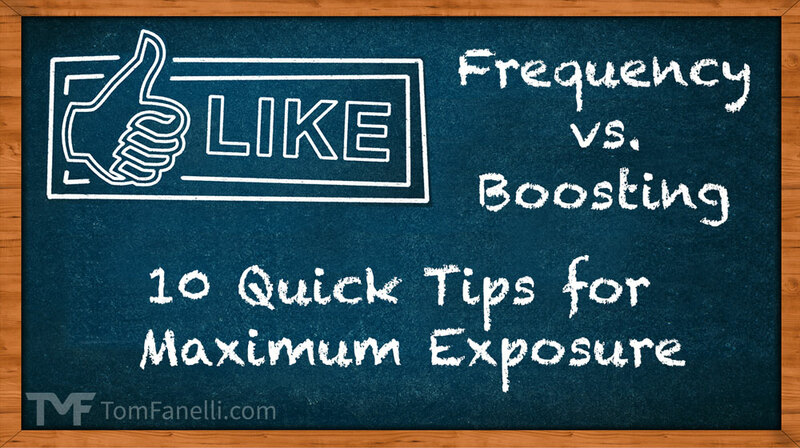 Should You Focus on Frequency or Boosting Facebook Posts? Facebook’s new algorithm change has altered the playing field for social media marketers. 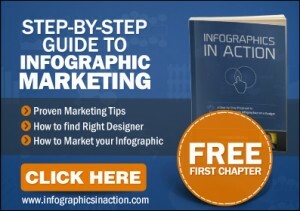 It’s harder than ever to get your content in front of customers without boosting Facebook posts. The change has made many wonder: is it better to post frequently and not boost it… or to write less content but boost every post? Here are a few things to think about when considering how to allocate your time and marketing budget. It’s time to revisit your strategy on the frequency of posts. I’ve noticed that many companies find a strategy that works and then set it on auto-pilot. That’s great… up to a point. And because of the recent Facebook algorithm change, that point is now. Are you still seeing the same level of engagement as you were previously? What about your conversion rate? Be aware of existing data about the effectiveness of different posting frequencies. 2 times per day, seven days a week, 10:08 a.m. and 3:04 p.m.
Another company, SocialBakers, analyzed top brands on social media and found that they post on average 1 time per day. 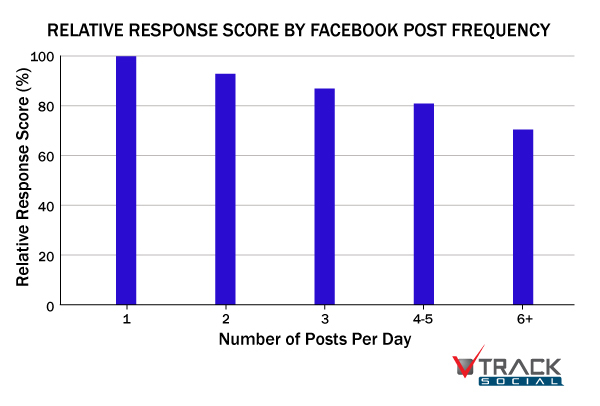 Track Social explored the effect that multiple posts per day had on the total number of responses. You’ll notice that response rates continue to be high on subsequent posts, though it does slowly decline. However, this advice should be taken with a grain of salt. After all, it’s taking into account companies of all different sizes, locations, and industries – and the data was collected before the new algorithm was implemented. Your particular business could find a more effective strategy that goes completely against this data. You can create world-class content, but it doesn’t matter if no one sees it. It can be frustrating to invest in killer social content but see it get no activity, and that’s exactly what more and more companies experience due to the new Facebook algorithm. Posting isn’t the same thing as engagement. This is an important distinction. You can post 10 times a day but have ZERO engagement. Do you notice that, again and again, no matter what type of content you are publishing, no one is clicking, liking, and commenting? Then it’s time to consider allocating more of your budget towards boosting than creating. Focus on moving your fans over to newsletter subscribers. Don’t want to be held hostage by Facebook’s next algorithm update or any other changes they make to their platform? You have more control over what your “fans” view if you can email them information directly. If you’re spending money boosting, you want to ensure the content is effective. Here’s the flipside of that. If you’re investing in boosts for your Facebook posts, then you want to ensure that money isn’t wasted promoting sub-par content. So how do you define effective content? It should help establish your company’s expertise, build your brand, convert into sales, or build your email newsletter – or, even better, achieve many of these goals at once. Be aware of the 20% text rule. Facebook won’t let you boost a post that has more than 20% text. The idea is to keep the site from feeling too ad-driven. That’s true even if you aren’t directly uploading the image to Facebook but instead posting an article that features an image which will appear in the post. Since it’s not easy to determine if an image has too much text, Facebook has made the process a little easier by offering this Image Grid Tool. You can upload an image, and it will help you determine if it will pass or fail their test. 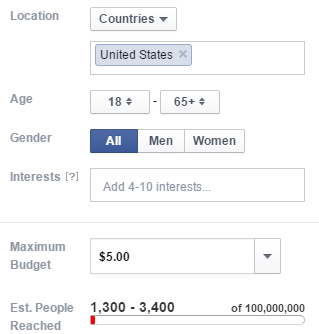 When you boost your post, you have three options for who you can target: people who already like your Page, people who already like your Page and their friends, or people you select through targeting. If you feel confident that your current fans are the right audience, then the first option is great, and the second option may be effective as well. But you can help expand your reach – and ensure you’re being seen by the right people – by making use of the third option. You’ll see choices for countries, age, gender, and interests, as well as get an estimate for the number of people you will reach. You can also tailor some posts for a particular subset of your audience. Don’t overlook the power of content curation. Content curation means finding others’ world-class content and reposting it. The key is finding the right content to curate, but it can help reduce your content creation costs, which can allow you to divert more funds to boosting the content you do invest in. And in turn, that can help you with the next tip. Don’t boost the content you’re curating. Why spend money to drive traffic to someone else’s content? Save your budget to focus on the content you are creating. Make sure your content schedule is consistent. You want to develop a rhythm that works for your brand – and that your followers can depend on. It helps to build your audience and develop loyalty. That doesn’t mean you can’t experiment, but it will be less effective to post very sporadically. Ideally, you want to plan adjustments over longer periods of time, such as testing a particular frequency of posting for a month at least. Remember, you can help maintain a higher level of frequency by supplementing content creation with content curation, while still keeping your costs down. There’s no one-size-fits all for social media strategies, but with the new algorithm, it’s easier to make a case that writing less content (but ensuring its quality) and boosting it can be more effective than writing more content (yes, even good content) and not boosting it.